Many times when you create a survey, you only want to ask a couple of quick questions (we actually suggest keeping your surveys as short as possible). So when you throw on an "Intro" slide to the start of that survey, it adds an additional step that feel really unnecessary. Today we've enabled the ability to disable the Intro slide. Disabling the Intro slide means your survey will start with the first question right when the survey loads. 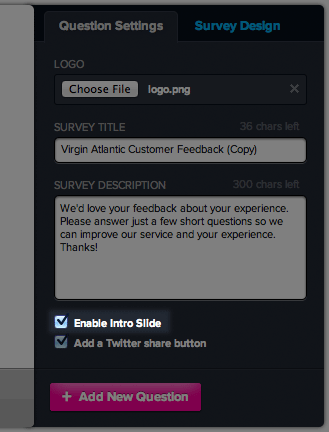 The intro slide is enabled by default, so if you'd like to disable it, just open up the Survey Editor for any given survey and click on the "Intro" slide on the left. You'll then see a new option in the Question Settings on the right with a checkbox to enable or disable the intro slide. This new option is available to everyone (free and paying plans). Enjoy!